Did you hear that some photography I did ended up in Nail It magazine? And one of those photos was a bottle of Digital Nails polish? Well, now you know. And it made me feel like a rockstar. 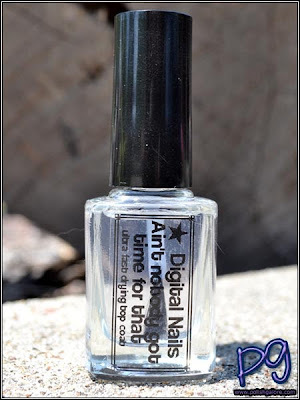 Prior to that, I decided to place another order from Digital Nails and she added in a bottle of Ain't nobody got time for that, her new ultra fast drying top coat. This is a big 3 free top coat that also doubles as a glitter smoother - it's not as thick as Lynnderella Glitter Tamer, but thicker than Seche Vite. I used it over my Essie Sunday Funday manicure but have also used it over other manicures and I'm happy to report that it does dry fast - not as fast as Cult Nails Wicked Fast but faster than Seche Vite. And I haven't had any problems with shrinkage. Ooo nice! Please update with how this wears (any cracking or premature chipping), if you can. I haven't had any issues and I've been wearing this as a top coat since late July! and because the name is amazing! Hello? Sweet Brown? is no one here from the internet?